If you want to add something, just click "Add a Page Element" and select from a list of various Page Elements. If you want to move something, just hover your mouse over the Page Element you want to move, the normal "white arrow" mouse cursor will change to a "cross arrows mouse cursor" (highlighted by a pointing red arrow in the screenshot of the LAYOUT above), and all you need to do is to right-click on the mouse, drag and drop the Page Element to wherever you want it, click "Save" at the top right of the LAYOUT. No need to edit the template. No need to know anything about HTML, CSS, widget codes, etc. And Google Blogger is increasing the number of list of Page Elements with time plus other third party developers are adding more widgets (same as Page Elements) for you to use. I will publish another post regarding the advantages later as this post is about how to migrate from old classic Blogger template to New Blogger template. If you are worried about losing your customizations, I will write about it later. 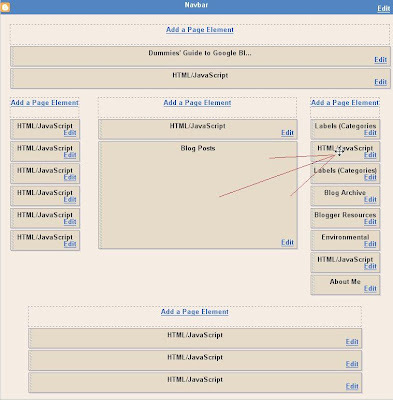 Go to blogger.com, sign in to Dashboard, click TEMPLATE for the blog you want to upgrade to New Blogger template. This will take you to the template editor. The very first thing you should do is to backup your template. Click on the inside of the template editor window, right-click and choose "Select All" (or press ctrl+A) to highlight the whole template, right-click again and select "copy" (or press ctrl+C) open a Notepad file, paste the old classic template into the Notepad file by right-clicking and choosing "paste" (or press ctrl+V), save it in a suitable folder with a descriptive file name, including as much details as possible, possibly including the name of the blog plus the date, etc. Make full use of the ability of Windows to use long file names. This will save whatever customization you may have done and help you put them back into the New Blogger template plus give you the chance to get back to your old template if you changed your mind. Actually this may be a superfluous step if you just want to revert to the old classic template as Blogger save it for you, but if you choose to continue with the New Blogger template, this backup template can easily help you extract various customizations you have like visitor counter, advertisements, etc., if you can recognize them. Click the "Customize design" sub-tab, then click UPGRADE YOUR TEMPLATE. You will then see a list of New Blogger templates. If you can decide on one, fine. If not, choose anyone and don't worry. You can always change later. Click "SAVE TEMPLATE". Don't worry. You can easily change later. If there is no standard Blogger templates you like, there are third party New Blogger templates at FAQ: 3 column New Blogger templates. If you want to know why I use this template for all my main blogs, surf over to Best template for my blogs. Template choices are obviously a very personal thing, so you may not agree with me. However, you are free to choose from the templates tested and demonstrated in FAQ: 3 column New Blogger templates and more will be added as I have the time to add them. Sometimes bloggers request help for setting up online business with minimal expenses. It is possible to make money online by setting up business blogs. A good example will be Good Pharmacy Online. It is planned, among others as an affiliate for Online Canadian Pharmacy Escrow Service. When you set up a business blog, you should pay particular attention to the template such as things like having a fast page loading time. If a page takes too long to download, visitors will just surf away to another site. It should also have a navigation bar to assist in getting around the website easily and finding the information they are seeking. This business blog uses a sub-domain of Blogger, that is, its URL is something like myblog.blogspot.com. Registering your own domain that have a URL that is something like www.mywebsite.com may command more respect and may be more suitable for a business blog. Good Pharmacy Online may be converted to a New Blogger custom domain, which will use a similar URL minus the .blogspot.com soon. However, even after conversion to use own domain, the original blogspot blog URL will automatically redirect all visitors to the new (own) domain. I will post more about this, how to do it in the easiest and best way possible hope I will remember to update this post with a link to the new post about using custom domains. In the meantime, you may read about the Advantages of New Blogger custom domain (click BACK button to get back to this page). The Good Pharmacy Online currently have been set up to assist online purchase of medications like acne medications. It has just been recently set up and currently you will not see much there, but now mainly set up for demonstration, but it will be updated and improved slowly as one don't want to set up the whole thing all at once. If you do that, and then just leave it without updating, as time goes by, the search engines will start ignoring (or ranking lower) your website. I think it is better to go slowly, update it frequently. Search engines love websites that are regularly updated. There are many blogging services, also referred to as blogging platforms, which can enable anyone to quickly start a blog. Some are free, some you have to pay, some have both free and paid versions. Also, blogs are used for different purposes of which I will be writing about later, but I just want to mention one of them - business blogs. Blogger is a blog publishing system. It was created by Pyra Labs, which was bought by Google in 2003. Before Google bought it, there were both paid and free versions. After the purchase, there is only free version. Recently, Google Blogger introduced a more robust system with features long requested by their bloggers, and the most interesting one is custom domain (click BACK button to get back to this page). With this, you can register your own domain and use it for your Blogger blog and Blogger will redirect traffic from your old blogspot sub-domain to your own domain. Not only that, Blogger will even host your custom domain blog for FREE!!!! However, for reasons of their own, some bloggers prefer to host the blog on their own. Blogger is still free, but they will have to find a web host like Personal Website Hosting. You will of course have to pay hosting fees the quantum of which depend on the package you choose and other things like bandwidth needed, etc. Google Blogger is one of the most user friendly blogging service around and a complete beginner will be able to get a blog going very fast. However, if he is more fussy and want extras, there are always sites like Blogger Tips and Tricks which gives very useful and easy to follow instruction to do various thing with your blog. Wordpress offers both free and paid versions. I tried the free version and was not impressed. They are not as generous as Google Blogger. The paid version of WordPress is a blog publishing system written in PHP and backed by a MySQL database. The free version is very limited and does not attract me. Many says Wordpress has better and features, but that must be referring to the paid version. To use that you MUST host the blog yourself. However, business blogs may be attracted by the better features and may then opt for Business Website Hosting. There are many other blogging platforms including LiveJournal, TypePad, Movable Type, Vox, etc., all with different characteristics and features. I have no time to check them all out, but I am pretty sure they would not be as generous as Google Blogger which is owned by the Internet giant and cash rich Google who therefore can afford to be generous. The above linked web host Burton Hosting offers website templates which I doubt can be used for blogs, but which offers interesting stuff like Flash templates, Flash Introductions, PHP-Nuke Themes, Logo templates and Corporate Identities, all of which may appeal to business websites. I get lots of questions about graphic Headers for blogs as bloggers seem to like graphic (image) instead of plain text blog Header. Here is where I put links to all posts connected to graphic blog Header and also one on graphic post title. Whatever it is, I for one is very reluctant to delete a text Blog title as to me, it is very important from SEO (Search Engine Optimization) as search engines uses the text blog Header to try to figure out what your blog is all about and can help surfers searching for topics you put in your blog find your blog. I for one will never remove the text blog Header, but will find other means to add a graphic blog Header. TOS is short for Terms of Service which you should read before you use any services for your own security or getting into problems with the service providers. Refer to Google Blogger TOS (Terms of Service).